The Swiss love their wines so much, they consume more of it than they care to share with the world. Who can blame them, when they produce premium quality wines in limited quantities? Valais is Switzerland’s largest wine region, comprising 40 percent of the country’s annual production. Of the 22,000 grape growers cultivating vines across 5,200 hectares along the Rhine’s 13 valleys, only 700 growers actually produce and bottle wine commercially. Around 50 grape varieties with AOC designation of origin are grown in Valais, some of which are indigenous, such as the Arvine and Cornalin (Rouge du Pays). Switzerland’s oldest vine is the “Vitis Antiqua 1798”, a Cornalin grown in the heart of the Leuk district. It was has garnered awards for its dark red, rich and velvety notes. More mainstream wines are the dry, white Fendant from Chasselas grapes, and the Dôle, a blend of Pinot Noir and Gamay. Several of the near-vertical vineyards date back to Roman times, and today benefit from dry stone walls that support the terraces and regulate the micro-climate. Visperterminen, for example, climbs to an altitude of 1,150m, making it the highest vineyard in Switzerland, and arguably in all of Europe. It’s Heida grapes, otherwise known as Savagnin blanc, produce a distinctive white wine with mineral aromas and fruity notes. Saillon, on the other hand, is registered as the smallest vineyard in the world, although this diminutive claim belies its magnanimity. Ownership of the vineyard was bequeathed to the Dalai Lama in 2000 by Abbé Pierre, who founded the Emmaus charity in 1949 to help the poor and homeless. Just three vine stocks yield a few thousand bottles, proceeds of which go towards helping underprivileged children. The Valaisans are as passionate about their food as they are about their wine, and a good introduction to the region’s specialities is the Valais Platter, comprising a variety of dried meats (cured ham, bacon and sausages). Instead of curing the meat traditionally in smokehouses, the preferred method here is air-drying for several weeks in a dark, dry storehouse or attic, a tradition that goes back to the 14th century. A special recipe using spices and salt results in a delicious and tender, deep red meat. The Valais Platter is served as an aperitif along with AOC Valais rye bread, gherkins, a variety of cheeses, and the special Raclette du Valais AOP. Raclette, while enjoyed by gourmands, actually came from humble beginnings. Indigenous to Valais, it was the staple food of farmers who herded cows up and down the mountains. At the end of the day they would gather around the campfire, over which they would melt the cheese until it’s soft enough to glide onto a piece of rye bread. Potatoes, gherkins, pickled onions and dried meat are typical accompaniments, washed down with tea. These days, however, Raclette’s fashionable companion has to be one of the region’s white wines, preferably a Savoy, Fendant or Pinot Gris. Valais wouldn’t be Valais without rye bread, a valued staple since the 13th century. Rye is the only cereal that can survive in harsh Alpine conditions, and in the old days villagers baked rye in communal ovens to produce big batches that would last throughout the winter season. On the slopes of Erschmatt above Leuk, rye is still cultivated in terraces and ground in the village mill. AOP Valais rye bread has a distinct texture, aroma and nutty taste, with exciting variations incorporating nuts, seeds and fruits. One dish that raises eyebrows is the Cholera pie, one of the region’s more delicious specialities. The pie derived its name from the pandemic that struck Switzerland in 1836, and fear of contracting the disease meant villagers stayed away from the streets and resorted to eating what was readily available in the pantry – potatoes, cheese, onions, leeks, apples, pears and bacon, which they combined and baked in a pastry. The dish is enjoyed in Valais today, but is unheard of in other parts of Switzerland. Those put off by the name are missing out on a scrumptious treat oozing with Raclette cheese, although they may find a more palatable-sounding version in Oberwalliser Lauchkuchen (Valais Leek Pie). Drei Tannen Restaurant in the charming hamlet of Niederwald serves a hefty portion of Cholera pie, best enjoyed with a good local beer. Less is known about the region’s more exotic products, one being saffron, grown and produced in the tiny village of Mund on the Rhine River’s right bank. Harvesting and drying of the stigmas are done by hand, a task shared by a community of families, helping to keep a tradition that goes back to the late 1800s, and is today designated as AOP Mund Saffron. Another prized gem is caviar, produced in Leuk by Kasperskian Caviar. Unlike caviar produced elsewhere in the world, the eggs are extracted using sustainable methods that keep female sturgeons alive, healthy and able to reproduce several times. Apart from adding a tiny amount of salt, the pearls are unadulterated, and Kasperskian Caviar is the only producer of “Caviar with Life” operating under international legal standards. Although Crans-Montana is a year-round leisure and sporting hotspot, it’s also leading the way towards establishing Valais as a European gourmet capital, thanks to chefs Chef Franck Reynaud and Chef Pierre Crepaud, who are at the forefront of the resort town’s culinary prowess. Franck Reynaud garnered one Michelin Star and 18 Gault&Millau points for his Restaurant Gastronomique L’Ours at the Hostellerie du Pas de l’Ours (www.pasdelours.ch) in the heart of town. The menu mirrors the chef’s passion for seasonal ingredients, and being in Valais means he gets the pick of fine quality meat, vegetables, fruits and herbs. Franck’s quirky repertoire includes deer fillet roasted and smoked on aromatic mountain hay, horseradish yoghurt, Gruyère ice cream with chestnut honey and Périgord truffles. At the adjacent Bistrot des Ours, the winter menu to tempt weary skiers is the Farmhouse guinea fowl with peanuts, kumquat, sweet pepper and smoked sweet potato. Hostellerie du Pas de l’Ours is a member of Relais & Chateaux. Further up the mountains, LeCrans Hotel & Spa (www.lecrans.com/hotel) occupies an enviable location overlooking majestic Alpine peaks. The boutique hotel’s sophisticated setting finds a perfect match in Chef Pierre Crepaud’s restaurant, Le Mont Blanc, where the food dazzles as much as the landscapes that wrap around the circular dining room. For those who prefer the invigorating Alpine chill, the heated terrace serves dishes from the brasserie menu, complimented with wines from the Vinothèque’s extensive collection. Pierre’s style is a delicate balance of flavours and textures presented with unpretentious panache. The Seabass tartare gets a kick from wakame dressing and kalamansi, which has a distinct semi-sweet citrusy tang that outshines yuzu, while the Valais lamb chop wrapped in chard works well with gambero rosso tartare. Fresh local apricots paired with Dulcey, the new chocolate sensation, makes a light, delicious ending. 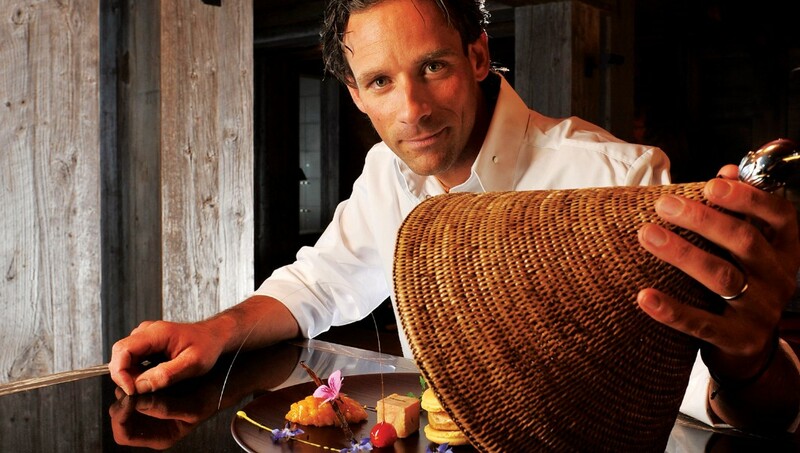 Le Mont Blanc garnered a one Michelin star and 17 Gault&Millau points. Gourmands craving more exotic flavours head for Mizuki by Kakinuma restaurant at the five-star Guarda Golf Hotel & Residences (www.guardagolf.com) in the heart of town. Following on from the success of their Japanese restaurants in Geneva, the Kakinuma family brings authentic Japanese culinary traditions to Crans-Montana with classics, such as grilled Wagyu beef, tempura, sushi, sukiyaki hot pot, Kaiseki and the Bento box. The sushi bar is intimate, while the elegant dining room overlooks the golf course and towering peaks beyond. A polished service completes the genuine Japanese dining experience. Every region has its artisan chocolatier, and in Valais they have L’Instant Chocolat, borne out of owner David Pasquiet’s passion for turning cacao into a work of art. David’s prior experience as pastry chef and cook moulded his creative and technical skills, which he applies to making exquisite chocolates. David and his wife Virginie travelled to Latin America in search of the highest quality cocoa beans for his own couverture chocolate, and were only interested in plantations that produce organic cocoa and look after the farmers’ welfare. Their quest led them to Peru’s Las Lomas region in northern Piura, where they grow Porcelana de Piura, a rare variety that yields white beans. Only certified organic ingredients are used with exotic flavours to tickle the taste buds, as in the Las Lomas chocolate with red Kampot pepper, coffee and cardamom chocolate bars, almonds coated with chocolate, chilli and coconut. Grand Cru bars come in 35 varieties, but the Choconougat (slice of nougat coated in white, milk or dark chocolate) is proving to be especially popular. The Ganache collection is the pièce de résistance for its pure artistry and imaginative flavours, such as matcha with sudachi juice, flambée banana with raisin and Matusalem 23-year-old rum, not to mention fig with AOP 25 year old balsamic vinegar from Aceitaia del Cristo. Resembling miniature planets, these round glazed morsels are too beautiful to eat. David L’Instant Chocolat shops (www.instant-chocolat.ch) are located in Crans-Montana, Sion and Vevey. Valais is a precious jewel in Switzerland’s culinary crown for its range of indigenous dishes, cutting-edge cuisine and quality wines. And while the region’s fare deserves more recognition on the worldwide foodie map, the good folks of Valais would love nothing more than for the world to come and savour their treasured favourites within the Rhone’s glorious Alpine settings.